11 Augus 2011, Jam News: Since the uprising of 2009, many Iranians have fled to western countries to seek shelter with the excuse that they are in danger. However, a wave of expulsions has followed after their lies have been uncovered. Jam News reports that for some time now, a number of opportunists have indicated that their lives are in danger in Iran and they could be executed; with this excuse, they seek this political asylum in Western countries. In some cases, this deception has been successful and some have been able to obtain asylum by betraying the country, propagating against the Islamic Republic, and becoming servants to the West. However, in other cases, the Westerners have not been deceived by these performances, and have denied asylum to these people. In the most recent example of these rejections, a person named Peyman Najafi, who claims he has abandoned Islam and calls himself Yarsani [a Kurdish group], has been trying to obtain asylum in Sweden. His claim to asylum is based on the possibility of being executed for his change of religion (obviously such an incident has not occurred in Iran for quite some time). Sweden, after considering his case and discovering his lies, has detained him and declared the date of his return flight to Iran. This has caused some in the Iran Global site to proclaim his innocence, and they have called other Iranians to object to the Swedish Government. It should be noted that such incidents occur frequently among Iranians who have escaped the country. Some in Greece have sewn their lips together in response to the rejection of their application for asylum. Another person has tried to burn himself in Greece. Many are suffering in the worst possible living conditions in the refugee camps of Turkey and Australia. Some in England have sewn their lips shut while on hunger strike as a response to the rejection of their asylum application. وقتی حنای فرصت طلبان رنگ می بازد! در حالی که عده ای بعد از فتنه 88 به بهانه در خطر بودن جانشان در ایران، به دنبال دریافت پناهندگی از کشورهای غربی هستند، موجی از رد شدن درخواست پناهندگی ایرانیان از سوی کشورهای غربی بخاطر فاش شدن دروغ هایشان به..
به گزارش جام نیوز، مدتی است عده ای فرصت طلب به بهانه فتنه 88 و مبارزه با جمهوری اسلامی، با ادعای خطرناک بودن حضورشان درایران و احتمال اعدام آنها[!] به کشورهای غربی فرار کرده و تلاش می کنند از آنها پناهندگی سیاسی بگیرند. گرچه در مواردی این حربه موفق بوده و عده ای توانسته اند با خیانت به کشور و مطرح کردن دروغ هایی علیه جمهوری اسلامی پناهندگی بگیرند و به نوکری برای غربی ها بدل شوند ولی در مواردی هم غربی ها فریب این نمایش ها را نخورده و با پناهندگی این افرد مخالفت کرده اند. کشور سوئد نیز با بررسی پرونده و مدارک وی با پی بردن به دروغ بودن ادعاهای این فرد مبنی بر در خطر بودن جانش در ایران، ضمن بازداشت وی، تاریخ پرواز بازگشت وی به ایران را اعلام کرده است و این بهانه ای شده است تا عده ای در سایت ایران گلوبال اقدام به مظلوم نمایی از این فرد و دعوت از دیگر ایرانیان برای اعتراض به دولت سوئد شوند. گفتنی است از این دست اتفاقات برای ایرانیان فراری از کشور بسیار پیش آمده است. عده ای در یونان بخاطر عدم قبول پناهندگی آنها از سوی دولت این کشور لب های خود را دوخته اند. فردی دیگر در همین کشور اقدام به خود سوزی کرده است. تعداد بسیار زیادی از این افراد در اردوگاه های ترکیه و استرالیا در بدترین شرایط زندگی می کنند تا جایی که بخاطر رسیدن به رویاهای خیالی خود فرزندانشان را در این اردوگاه ها از دست می دهند. حتی عده ای از همین افرد بخاطر عدم قبول پناهندگی آنها از سوی دولت انگلیس اقدام به اعتصاب غذا کردند و لب های خود را دوختند. 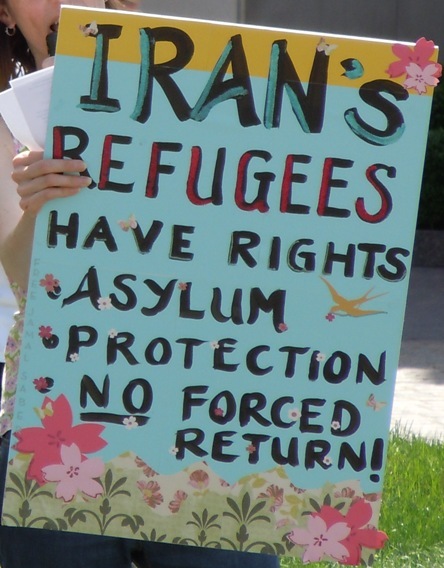 (note from Mission Free Iran: This article clearly demonstrates that the Islamic Republic not only follows the activities of Iranian asylum-seekers while they are abroad, but that the Islamic Republic is in actual fact prosecuting returned asylum-seekers on the basis of Article 7 of the Islamic Penal Code (as promised earlier by Eje’i and Molahzadeh in articles published in regime media and reproduced and translated below). The Iranian-Kurdish asylum seeker Rahim Rostami, who was deported from Norway in February2011 and imprisoned upon arrival to Iran, has been released on bail. According to sources Iran Human Rights (IHR) has been in contact with, Rahim Rostami has been charged with “Contact with alien countries and propaganda against the nation’s security”. The sources have said that Rahim Rostami’s asylum application and participation in opposition rallies in Norway are the bases for the charges. He has also an additional charge related to the time before he escaped from the country three years ago. The basis for this charge corresponds allegedly to the reason why he sought asylum. His trial is scheduled to be held in the coming days. IHR once again urges the European countries not to deport Iranian asylum seekers back to Iran. Mahmood Amiry-Moghaddam, the spokesperson of IHR said: The new charges against him are due to his participation in anti-government (Iranian) rallies while he was in Norway. This shows that the Iranian authorities monitor activities of the Iranians abroad and use it against them upon their return. Iran Human Rights, March 23: According to reports that reliable sources have given to Iran Human Rights (IHR), a Kurdish asylum seeker who was extradited from Norway to Iran on February 9th 2011, is in danger of torture and ill-treatment at Tehran’s Evin prison. He is identified as “Rahim Rostami” (19 years old) whose asylum application had been rejected by the Norwegian authorities was arrested by the Norwegian police on February 8th and extradited to Tehran, accompanied by two Norwegian policemen, on February 9th. After being handed over to the Iranian authorities he has been taken to interrogation and later to the notorious Evin prison where he is being held now. According to sources IHR has been in contact with, Rahim has spent several days in solitary confinement. Iranian authorities have refused releasing him on bail. “Rahim Rostami” sought asylum in Norway in 2008, when he was allegedely a minor. Norwegian authorities rejected his asylum application and decided to send him back to Iran. In the rejection letter the Norwegian authorities have stated that ” We have no reason to believe the asylum seeker (Rahim) will be subjected to persecution, ill-treatment or imprisonment upon his return to Iran”. Mahmood Amiry-Moghaddam, the spokesperson of Iran Human Rights urged the Norwegian authorities to do whatever they can do in order to save Rahim’s life. He said: “Norwegian authorities must take their share of the responsibility for this individual’s imprisonment in one of the world’s most notorious prisons”. Amiry-Moghaddam added: “It is not clear what charges are raised against him, but the fact that the Iranian authorities have refused to release him on bail indicates that his case is serious”. Amiry-Moghaddam also urged the human rights organizations, the civil society and Rahim’s friends in Norway to start a campaign to help “Rahim”. On extradition of Iranian asylum seekers to Iran, Amiry-Moghaddam said:” Iranian authorities have recently signalized that Iranians who have sought asylum abroad should be charged for “dissemination of false propaganda against the Islamic Republic of Iran” and punished for that. This means that seeking asylum by itself could be a reason for the Iranian authorities to subject the asylum seekers who are extradited to Iran, to persecution, imprisonment and ill-treatment. Amiry-Moghaddam urged the authorities of Norway and all other Western countries to immediately stop extradition of Iranian asylum seekers to Iran. حقوق بشر ایران، ۳ فروردین ماه ۱۳۸۹: به گزارش منابع موثقی که بدست سازمان حقوق بشر ایران رسیده، یک پناهجوی کرد که ۲۱ بهمن ماه ۱۳۸۹ توسط مقامات نروژی به ایران بازگردانده شده بود در زندان اوین بسر میبرد و میتواند درمعرض خطر جدی باشد. رحیم رستمی ۱۹ ساله، که تقاضا ی پناهندگی اش توسط مقامات نروژی رد شده وحکم ترک خاک نیز گرفته بود ، ۲۰ بهمن ماه در حالیکه قصد باز کردن یک حساب بانکی داشت توسط پلیس امور مهاجرت نروژ دستگیر شده و روز بعد به همراه دو پلیس نروژی به ایران فرستاده شد. پس رسیدن به ایران و تحویل به مقامات ایرانی، رحیم مورد بازجویی قرار گرفته و به زندان اوین منتقل شد. بنا به گزارشات رسیده به سازمان حقوق بشر ایران رحیم چندین روز را در سلول انفرادی گذرانده است و احتمال میرود که مورد بد رفتاری و آزار قرار گرفته باشد. به گفته این منابع ، مقامات حکومتی از آزادی رحیم به قید وثیقه ۱۰۰ میلیون تومانی خود داری کرده اند. رحیم رستمی در سال ۲۰۰۸ میلادی در حالیکه کمتر از ۱۷ سال داشت از کشور نروژ درخواست پناهندگی کرده بود، اما مقامات مهاجرت نروژ دلایل رحیم برای درخواست پناهندگی را باور نکرده و تقاضای وی را رد کردند. در نامه ای مقامات نروژی نوشته اند: “ما باور نداریم که پناهجو، رحیم رستمی پس از بازگشت به ایران در معرض آزار و بدرفتاری، تعقیب و یا حبس خواهد بود”. محمود امیری مقدم ، سخنگوی سازمان حقوق بشر ایران از مقامات نروژی خواست تا آنچه که در توان دارند به منظور نجات جان رحیم به کار گیرند. او گفت : “مقامات نروژی باید به نوبه خود سهم مسئولیت خود، اینکه رحیم در یکی از بدنام ترین زندان های جهان بسر میبرد را بپذیرند”. وی افزود : “اتهام رحیم هنوز روشن نیست، اما این که مقامات ایرانی از آزادی رحیم به قید وثیقه خودداری کرده اند نشان میدهد که پرونده او جدی است “. امیری مقدم همچنین از همه سازمان های حقوق بشر ، جامعه مدنی و دوستان رحیم در نروژخواستار شروع کمپینی برای نجات جان وی شد”. امیری مقدم در مورد بازگرداندن اجباری پناهجویان به ایران گفت: ” به تازگی یک خبرگزاری وابسته به یک ارگان امنیتی نوشت : “با توجه به ماده7 قانون مجازات اسلامي هر يك از اتباع ايراني كه در خارج از كشور مرتكب جرم شده و به ايران بازگردانده شوند مجازات خواهند شد، چنانچه اين فرد از طريق «كيس نويسي» براي پناهندگي اقدام كرده باشد به اتهام تبليغ عليه نظام تحت تعقيب كيفري قرار خواهد گرفت ” . این بدان معناست که اقدام برای پناهندگی به خودی خود میتواند دلیل برای مجازات باشد. از این رو ما از دولت نروژ و تمامی دولتهایی که با پناهجویان ایرانی مواجه هستند می‌خواهیم که از باز فرستادن آنها به ایران اکیدا خودداری کنند. In recent years, due to curtailing of acceptance as well as granting visas and travel permits to Iranian nationals by countries like the USA, Australia, Canada, and European, many Iranian immigrants have been deceived into receiving false travel documents by those who are in the criminal immigration business, such as counterfeiting visas as well as human trafficking. These robbers and criminals are exploiting this situation as a business opportunity to committee massive fraud. For example, these criminals claim to have various networks capable of issuing tourist visas or permanent residencies in a foreign country. These people receive enormous sums of money for their empty promises and quickly vanish from sight. In some cases criminals offer fake passports or visas for substantial sums of money, which they take and then escape, leaving the client with forged and fraudulent documents. Sometimes these people even look for desperate clients through their network just to be able to deceive more people with their lies. For example, in many recent judicial cases of this nature we have witnessed applicants who have been invited to travel abroad to Dubai, Turkey, Pakistan, Malaysia, and Thailand where they pay a lot of money for forged passports or visas, and without knowing the authenticity of these documents when the victims travel to destination country they are arrested at the airport for possession of false travel documents. In some cases these criminals forge legal documents for their clients so they can present these documents to authorities and claim an asylum application on basis of prosecutions of political activities. This is basically writing a false case for asylum. However, in recent years, many countries issuing asylum have been made aware of falsification of asylum applications. According to Article 7 of the Islamic criminal law, any citizen of Iranian who commits a crime outside of Iran’s territory, when returned to Iran they will be prosecuted and charged with propaganda against the system. Therefore I am recommending that the following authorities including the Ministry of Foreign Affairs, Police, Judiciary, and IRIB (Islamic Republic’s National Broadcasting) work closely to prevent such criminal acts. We also recommend to Iranians seeking illegal travel abroad to avoid these immigration schemes and stop being deceived. در سالهاي اخير به خاطر سخت‌گيري‌هاي بسياري از كشورهاي مهاجرپذير از جمله امريكا، استراليا، كانادا و اروپايي‌ها در پذيرش مهاجران يا اعطاي ويزا به متقاضيان، شاهد افزايش فعاليت‌هاي تبهكارانه در زمينه قاچاق انسان و جعل ويزا هستيم. به همين خاطر برخي از متقاضيان ناكام از دريافت ويزاي قانوني جذب شيوه‌هاي غيرقانوني مي‌شوند. مجرمان و افراد سودجو كه همواره در تلاش براي سوءاستفاده از كوچكترين فرصت ها هستند با عناوين مختلف به «كلاهبرداري‌هاي كلان» مي‌پردازند. به طور مثال مجرمان براي فريب متقاضيان ادعا مي‌كنند مي‌توانند از طريق عوامل و ارتباطات مختلف‌شان ويزاي توريستي يا اقامت تهيه نمايند. بدين ترتيب آنها با جلب اعتماد متقاضيان، مبالغ هنگفتي دريافت كرده و بدون اينكه از خود كوچكترين اثري بر جا بگذارند در چشم به هم زدني متواري و ناپديد مي‌شوند. در برخي موارد نيز تبهكاران با ارائه ويزا يا گذرنامه جعلي مبالغ قابل توجهي را گرفته و متواري مي‌شوند. در مواردي هم جاعلان و كلاهبرداران از طريق حضور در ساير كشورها و با كمك عوامل‌شان به شناسايي، شكار و فريب طعمه‌هايشان مي‌پردازند. به عنوان نمونه در بسياري از پرونده‌هاي قضايي مشاهده شده كه برخي، متقاضيان سفر به خارج از كشور را به دوبي، تركيه، پاكستان، مالزي، تايلند و ساير كشورها دعوت كرده و در آنجا با دريافت مبلغ قابل توجهي گذرنامه يا ويزاي جعلي رد و بدل مي‌شود. حال آنكه متقاضي هنگام سفر به كشور مقصد به راحتي در فرودگاه شناسايي و دستگير مي‌شود. در برخي موارد نيز جاعلان و كلاهبرداران با جعل احكام مراجع قضايي مدعي مي‌شوند كه شخص متقاضي به لحاظ فعاليت سياسي تحت تعقيب است تا بدين وسيله بتوانند پناهندگي اجتماعي از كشور مهاجرپذير دريافت كنند كه به اين شيوه اصطلاحاً «كيس‌نويسي» مي‌گويند. البته در سالهاي اخير بسياري از كشورها متوجه اين شگرد شيادان و جاعلان شده‌اند. به هر حال با توجه به ماده7 قانون مجازات اسلامي هر يك از اتباع ايراني كه در خارج از كشور مرتكب جرم شده و به ايران بازگردانده شوند مجازات خواهند شد، چنانچه اين فرد از طريق «كيس نويسي» براي پناهندگي اقدام كرده باشد به اتهام تبليغ عليه نظام تحت تعقيب كيفري قرار خواهد گرفت. بنابراين پيشنهاد مي‌شود مسئولان ذيربط از جمله وزارت امور خارجه، نيروي انتظامي، قوه قضائيه، سازمان صدا و سيما و مطبوعات در اين زمينه براي پيشگيري از چنين مواردي اطلاع رساني دائم و مناسب داشته باشند. به متقاضيان غيرقانوني سفر به خارج از كشور نيز تأكيد مي‌شود از چنين روش‌هايي بشدت پرهيز كرده و فريب نخورند. Mohseni-Eje’i emphasized that the chief prosecutor would undoubtedly open court cases for them, and that they would be punished if they ever returned to Iran, and if they did not return to Iran, the chief prosecutor must sentence them through the international authorities. واحد مرکزی خبر گزارش داد، حجت الاسلام والمسلمین غلامحسین محسنی اژه ای پاسخ داد: بسیار بدیهی است ایرانیانی که مرتکب جرمی در خارج از کشور می شوند و یا حتی کسانی که تبعه ایران نباشند و علیه ایران اقدام کنند و در خارج از کشور باشند قابل تعقیب و پیگیری هستند. وی افزود: هم اکنون کسانی در خارج از کشور هستند که روزی در این کشور ادعایی داشتند اما هم اکنون خیلی ذلیلانه در حال همکاری با آمریکایی ها و انگلیسی ها هستند و علیه مردم و کشورشان اقدام می کنند و این روسیاهی برای آنهاست. محسنی اژه ای با تأکید بر اینکه مدعی العموم حتماً برای آنها پرونده تشکیل می دهد گفت: آنها باید حتماً تعقیب شوند و اگر روزی به ایران بیایند در داخل مجازات شوند و اگر هم در خارج از کشور باشند مدعی العموم باید از طریق مراجع بین المللی آنها را تعقیب کند که حتماً دادستان ها این کار را خواهند کرد. Iranian community members in Australia have reacted with alarm to news that the government in Tehran plans to set up a special court to prosecute Iranians living abroad for taking part in pro-democracy protests against the regime. Reports from unofficial Iranian news websites say the special Revolutionary Court, announced this week by the country’s Justice Minister, Morteza Bakhtiari, is intended to prosecute Iranian nationals who take part in anti-regime protests in countries such as Australia where pro-democracy movements have flourished since last year’s disputed elections and anti-government uprising. The revelation coincides with reports from Iranian-Australians that the Iranian embassy in Canberra is spying and collecting intelligence on pro-democracy activists in Australia. Some individuals involved in the democracy movement here have been detained, interrogated and threatened with severe punishment on visits home to Tehran. The Iranian embassy has “categorically rejected” these claims. Mr Rafiei told The Australian that in the past two months two Iranian-born Australians had been detained and interrogated about their pro-democracy activities in Australia when they took trips back to Tehran. They were both shown photographs of protest rallies they attended recently in Brisbane, and one was shown a list of names of democracy campaigners based in the Queensland capital and asked to identify them. Pro-democracy activists in Melbourne, Sydney, Brisbane and Canberra have told of being abused, harassed and threatened by Iranian-born supporters of the Ahmadinejad regime who are now living in Australia. One activist, Afshin Nikouseresht from Iran Solidarity Melbourne, said he had no evidence that the perpetrators were working for the Iranian government. However, others said they believed the Iranian government had sent “spies” posing as university students to report back on the local community. Iranian Justice Minister Morteza Baktiari announced on April 3 that a special court will be established for Iranians living outside the country. He didn’t give the reason for the move, but said that the head of Tehran’s Justice Department and the head of the Revolutionary Court have announced their preparations to create the court. The timing of the move has led to speculation that it could be a reaction to the huge show of support and solidarity by Iranians living abroad for members of the opposition movement that took to the streets last summer to protest against the reelection of President Mahmud Ahmadinejad. By setting up the court, the Iranian government seems to be trying to send a warning to some of the Iranians based outside Iran who are actively campaigning and supporting the green movement. Radio Farda reports that some Iranian officials have threatened to take judicial actions against Iranian expats for their show of solidarity with the opposition street protests in Tehran. A special prosecutorial branch will be established shortly to deal with Iranians residing abroad, said minister of justice. During a meeting of the High Council for Coordination of Iranian Expats, minister of justice Morteza Bakhtiari said necessary steps have been taken to establish a special prosecutorial branch that will deal with Iranian living outside the country. Bakhtiari did not specify the reasons for establishing the special branch or its mandate but said, “The heads of Tehran justice department and the Revolutionary Court have announced their readiness to implement the plan”. With Tehran Prosecutor’s efforts, 2 branches of first and appeals courts and several branches of magistrate courts will be assigned to deal with expats affairs. Answering to a question about political refugees, Bakhtiari said, “Intelligence and judicial authorities have representatives in this Council and will take appropriate decisions about political refugees”. In the past months, Interpol has turned down repeated requests by Iranian authorities to issue arrest warrants for political and civil activists residing outside Iran. It appears that the establishment of a special branch is to exercise further pressure on Iranian refugees. Iranian refugees in Turkey who have recently emigrated for political reasons are more vulnerable than Iraqi and Afghan refugees, according to a report. Security forces from Iran have often entered Turkey to pursue and terrorize asylum-seekers, said the report prepared by OMID Advocates for Human Rights. An OMID delegation interviewed Iranian refugees and asylum seekers as well as organizations to help these migrants in Turkey. “Two refugees reported to the OMID’s delegation that they had been assaulted by Farsi-speaking men. Another refugee reported being questioned and threatened while in the hospital by representatives of the Iranian government stationed at a consulate in Turkey,” said the report. Not only refugees in Turkey, but their families left in Iran have been threatened or arrested by the Iranian security forces, according to the report. Many refugees reported that their parents and other family members had been contacted, threatened or arrested in Iran. Due to these ongoing threats and contacts by the security forces, many Iranian refugees reported high levels of stress, insomnia, migraines and other symptoms, suggesting a lack of psychological well-being and ongoing “re-traumatization,” said the report. After Iraqis, Iranians make up the second largest group of asylum-seekers and refugees in Turkey with a total number of 4,312 as of February 2010, said the report. Although the registered number shows that the new arrivals from Iran have not changed since 2008, the report said there is evidence that the number of Iranians fleeing to Turkey has increased following the June 12, 2009 elections in Iran. The report estimated that at least 2,000 unregistered Iranian refugees fled to Turkey between June and December 2009. These recent unregistered refugees have been single men and women between the ages of 20 and 35 who have fled to avoid political persecution due to mistreatment for their political opinions. They were often engaged in journalism, filmmaking or other media activities, including citizen journalism, documentary making, blogging, radio interviewing and internet campaigning back in Iran, and they did not just leave Iran to find better livelihoods in Turkey. In Turkey, they lack support for their families, and there are very few internal and foreign nongovernmental organizations that provide financial assistance to them, said the report, adding that it is almost impossible for them to find a legal job in Turkey. Although Turkish law allows refugees to work, it says many can only work in jobs for which a qualified Turkish national cannot perform. “This is why no asylum seeker is legally authorized to work in Turkey, and it is also known that they are pushed into a system of labor exploitation,” said the report.